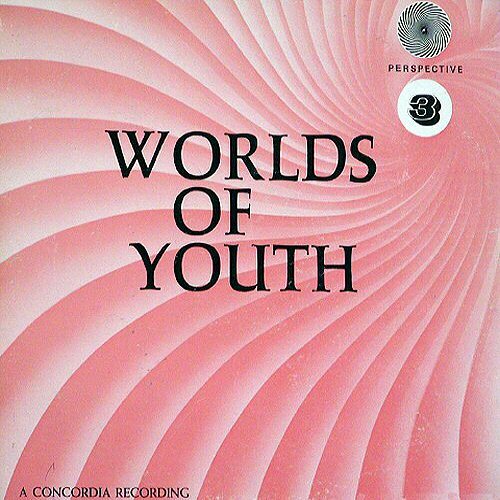 Worlds Of Youth (Concordia 79-9066) 1968? Nine more groovy cerebral meanderings with titles like ‘Forgiveness (The Boy Looking Natural)’, ‘AWOL’s Of Life’, ‘Pictures (The Nasty Picture)’, ‘Rhythm (God Made Rhythm)’, ‘Baptism (Come To War)’ and ‘Martyrs’, all of which fuse “faith to the beat and rhythm, the issues and drama of Century 20 1/2”. The selections are inspired by the book ‘Worlds Of Youth’, authored by fellow enlightened Lutheran Herbert Brokering. Very similar to Silhouette Segments with each track averaging around four minutes and featuring a bizarre dramatization followed by an often equally bizarre commentary. Rydgren’s convoluted brilliance is in full form here, along with his knack for selecting wild and varied background music. An unidentiﬁed hip female assists on several of the sketches, often speaking in a spacey deadpan murmur, or dialogue with Rydgren as he ﬂies a kite made from a newspaper on ‘News (The Kite And News)’ (“Here comes my world God! Take it!”). Includes a couple rare examples of Rydgren singing, mocking over—expressive on ‘New Songs (New Song, Guitar)’, in a priestly liturgical monotone on the epilogue to ‘Computers’. I could go on and on but it’s best just to hear the thing, so keep your eyes peeled next time you see a stack of those Concordia educational records in your local thrift store. The album plays with a special “locked groove” feature, so you’ll have to get up to advance the needle after each track. (The Archivist, 4th edition by Ken Scott). It maybe interesting to note that John was prophetic in forecasting the future of computers 8 years before the first personal computers. I like this. Very much. Thank you. BUT, why do you have to instigate a cghange of screen format for this site? I don't get it, what with all the harrassingment going on today? Am I too old for this sort of game, or just sick? Anyway, keep on keeping on.